Presentation plays a huge part in how your designs are perceived. By positioning your work in real brand settings, you instantly stand out from the crowd and bring your designs to life! Traditionally this meant scheduling a professional photoshoot, then spending hours digitally superimposing your artwork into place. However, with mockup templates, your artwork is transformed into a realistic looking finished product in a few clicks. 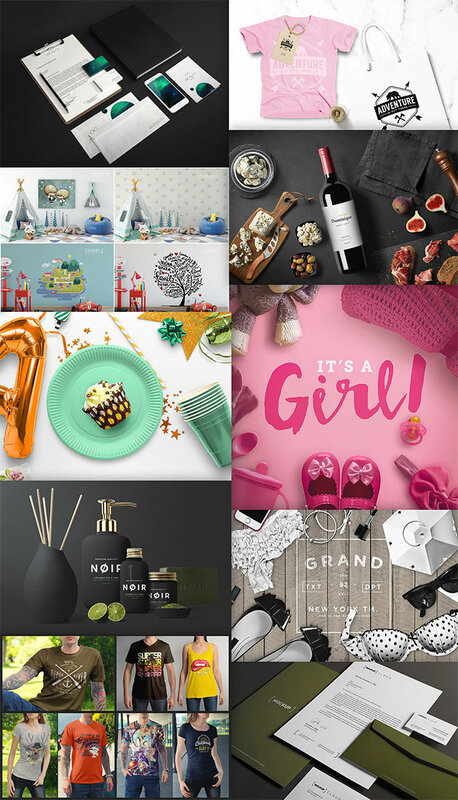 They’re ideal tools for presenting your design concepts to a client, or showcasing your work in your portfolio with much higher visual impact that a boring flat screenshot. 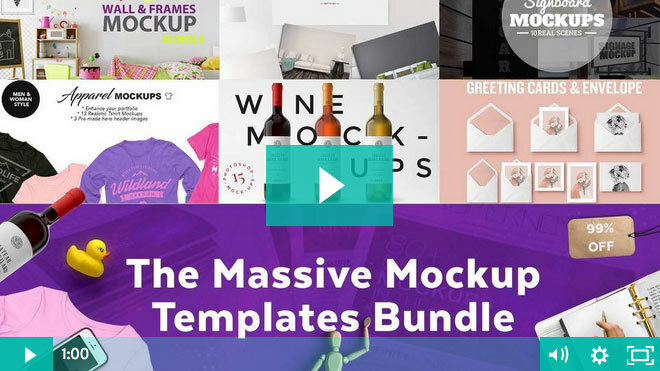 Usually these tools come at a premium, but this massive new bundle contains a huge variety of mockup templates and scene creator packs for just $29. 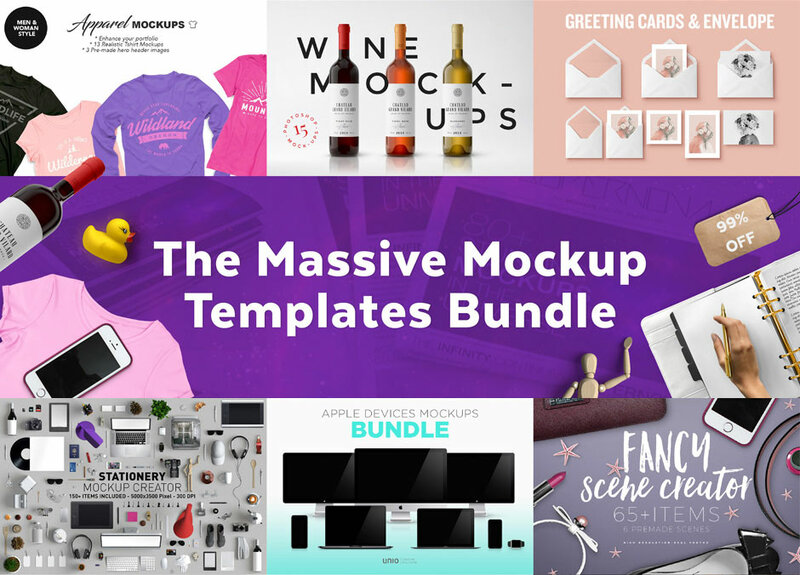 The range of objects, themes and subjects covered in the collection of products featured in The Massive Mockup Templates Bundle is staggering. 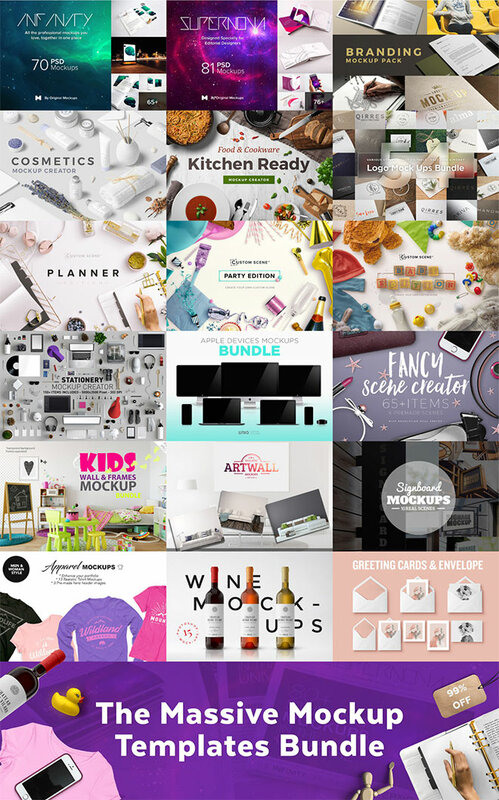 Whatever project you’re working on, this bundle will have the perfect template to let you show it off beautifully! There’s stationery items, brochures, business cards, badges, magazines, newspapers, billboards, outdoor media, posters, tablets, desktops, laptops, smart phones, browser windows, drinks, books, logo mockups, apparel, cosmetics, food/drink, labels, planners, party packs, baby themes, greeting cards, frames, signs, rooms/backdrops and more! That’s before we’ve even looked at the thousands of objects included in the range of scene creators, which are perfect for surrounding your artwork with complementary elements, producing a cool website header, or even forming the foundation of a design in its own right. These best selling products would usually add up to a total of $1000 if purchased individually, but this limited time offer sees that price slashed to just $29, making it a great opportunity to acquire some extremely useful tools to increase the value of your work. With a library of resources this large, you’ll have exactly what you need ready to use in your future projects! Absolutely Great Templates. Some of them are real evergreen templates.